Maps of the growing Israeli settlements on Palestinian territory are on display on buses and in a transit station in Canada’s western city of Vancouver and will soon roll out in Toronto and Calgary as well. “We think it’s important that Canadians be informed about the realities of the Israeli occupation and how it’s been growing consistently over the past 66 years, and to call for and support Palestinian human rights,” said Charlotte Kates of the Palestine Awareness Coalition, comprising seven peace and justice organizations sponsoring the ads. New maps could soon appear on TTC vehicles, and they won’t depict the subway line. 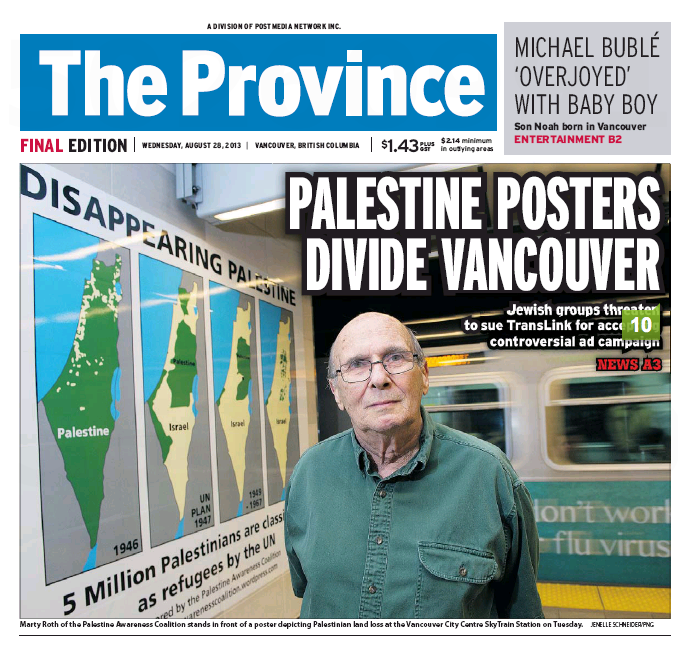 Vancouver Sun: Disappearing Palestine ads on public transit: offensive to Jewish faith or freedom of expression? Posted on September 3, 2013 by Seriously Free Speech Committee| Comments Off on Vancouver Sun: Disappearing Palestine ads on public transit: offensive to Jewish faith or freedom of expression? TransLink was misguided in its approval of the Disappearing Palestine ads. First and foremost, is the timing. The Jewish New Year occurs in the first week of September this year, and then there is Yom Kippur, which is their most sacred day of the year. The choice to buy ad space this time of the year strongly suggests intent by the Palestine Awareness Coalition to be provocative and insults those of the Jewish faith, as well as the legitimacy of the existence of the state of Israel. The ads should not have been permitted to proceed on this basis. Comments Off on Vancouver Sun: Disappearing Palestine ads on public transit: offensive to Jewish faith or freedom of expression? “Disappearing Palestine,” a new ad campaign running on Vancouver busses, suggests the history of the Palestinian people can be summarized in four words: going, going, going, gone. Public transit advertisements depicting an expanding Israeli territory are causing a fuss in Metro Vancouver, with some Jewish groups demanding the removal of posters from 15 city buses and a train station, and with pro-Palestinian organizations vowing to expand their “settlement and occupation” awareness campaign across Canada.